Entrance to the track is just below the Castle at Nurburg. Postcard showing the public entrance to the Nordschleife and the 'Grune Holle' restaurant. 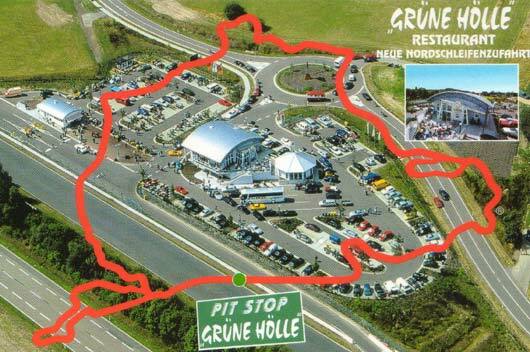 'Grune Holle' is the name given to the Restaurant at the entrance to the Nordschleife, and refers to a quote from Jackie Stewart who called the track the 'Green Hell'. Its a car park but I will refer to it as the paddock from now on. The road top left of the picture goes into the village of Nurburg, past the Castle. 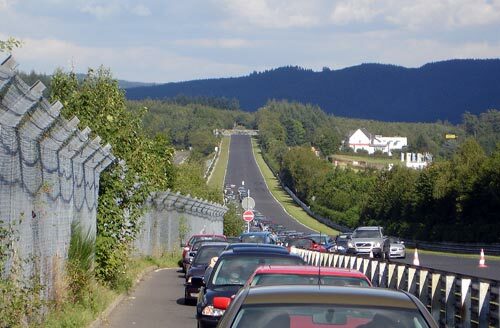 the road that goes off to the bottom right runs parallel to the main straight back towards Dottinger-Hohe. The larger road bottom left is the 258. 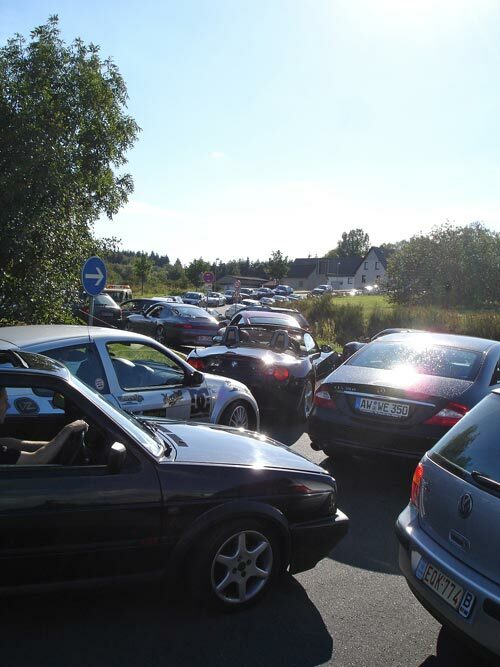 The entrance to the Car Park can get very busy - this is the road outside! When you come off the roundabout, turn left or right into the car park. On your first visit get out and have a look around. There are always some nice machines to look at in the paddock on a public day. 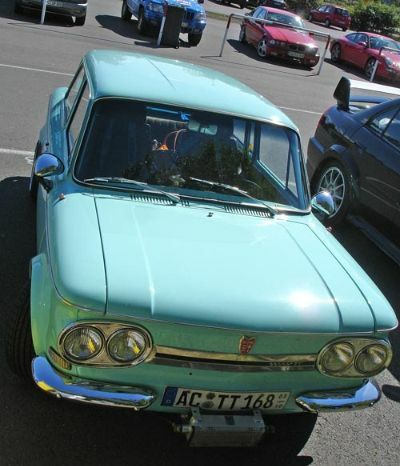 These will range from glistening Supercars - which will probably trundle round at a pretty safe speed - to local 'Ring specials - often stripped out Opels or Golfs, which will come absolutely flying past you as if you are standing still on the track! Track Closed! Entrance out onto the main straight. The important bit of this place is the smallest building on the right as you go in. This is the kiosk where you buy your tickets to enter the track. There is an automatic machine on the wall, or you can buy them inside. 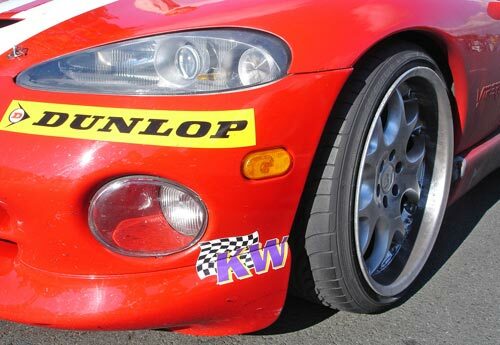 If you intend to do more than 5 laps its worth buying one of the tickets which has a number of laps on it at a cheaper rate. Make sure you get the right one though - there are different tickets for bikes, and some are only valid on the day they are bought. The Ring Taxi sets off from here, and just behind the kiosk you can see the yellow automatic barriers which release you onto your lap. 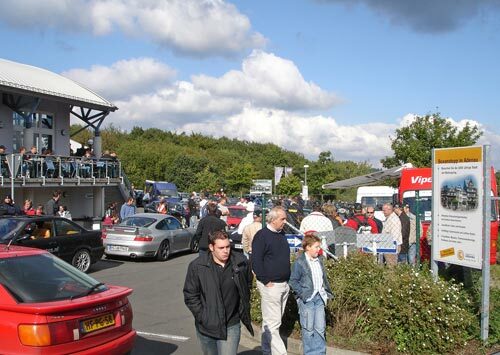 Typical busy day in the Car Park. Restaurant on the left. The largest building in the centre is the Restaurant, which has changing rooms and toilets underneath. The smaller round building to its left as you go in is a small BMW display area. 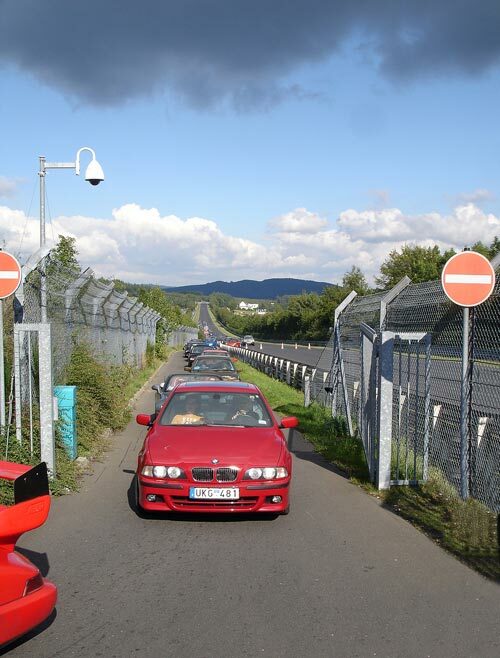 BMW have a strong link to the Nordschleife. 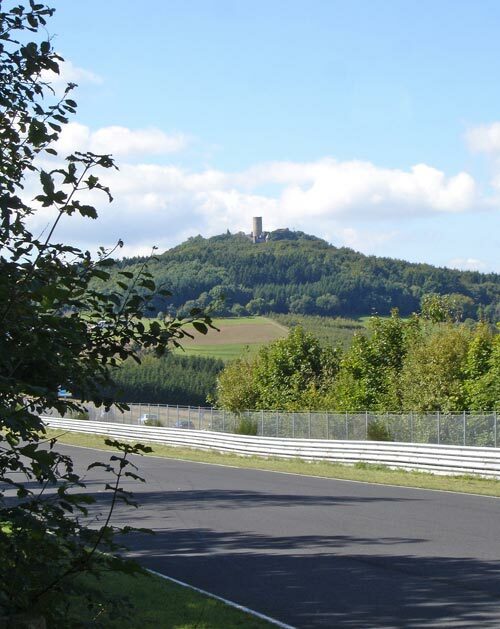 They have a compound within Nurburg where they are based as they test their range of new cars on the track when it is not open to the public (see our 'Scoop' section here) and they also run the Ring Taxi. 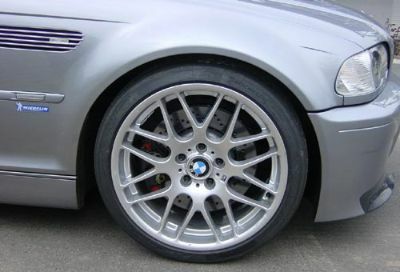 This consists of an M5 driven around at very high speed by a professional race driver - often the infamous 'Sabine' - a Blonde Goddess to many Ringers it seems! You can book a place in this taxi, but unless you can get in on a half empty Taxi ride on the day, you will have to book well in advance. 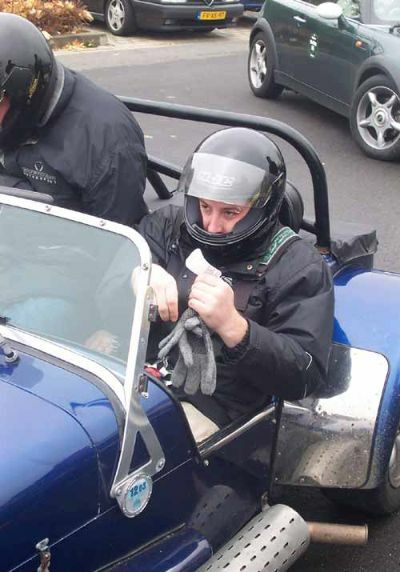 Never done it myself - but I will have to pluck up the courage at sometime I suspect (I am the worlds worst passenger!) However, I have almost been run over by the Taxi whilst actually on the track. Don't worry about holding Sabine up - she will get past whatever you do, probably without lifting. 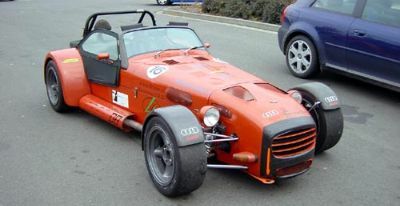 Sabine is well known by many more people as the lady who showed Clarkson how to drive around the 'Ring on Top Gear, and almost did a sub-10 minute lap in a Ford Transit van. Always worth relaxing and catching a breath between laps. 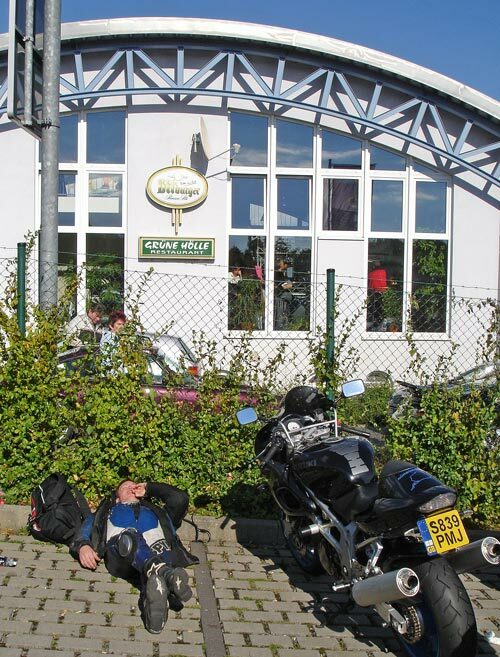 Always plenty of bikes - if its dry! Oops! 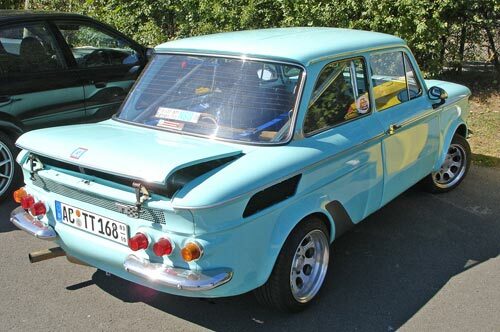 Not a victim of the Ring, rather another classic piece of tarmac! Good weather and a weekend can mean hundreds of cars wanting to do laps. 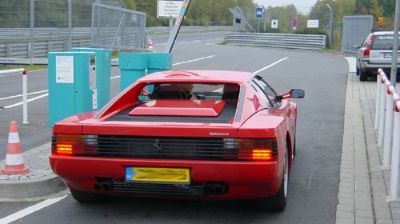 Tessa wondering how the 'holle' do you get into a Ferrari Testarossa?! 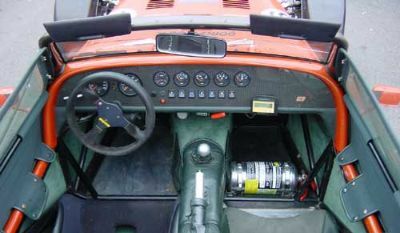 The door handles are hidden up under the side strakes. I had just taken the owner for a lap in the seven - now he was repaying the ride for Tessa - I was far too scared to passenger with anyone! Not quite sure what Tessa is signaling here! That she wants a stiff drink perhaps? This picture shows the automatic barrier through which you pass after popping your ticket in the machine on the left. Antoniusbuche straight is top left. 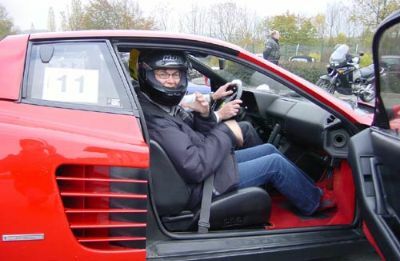 Tessa went in the Testarossa above for a lap and then in a Porsche GT3. 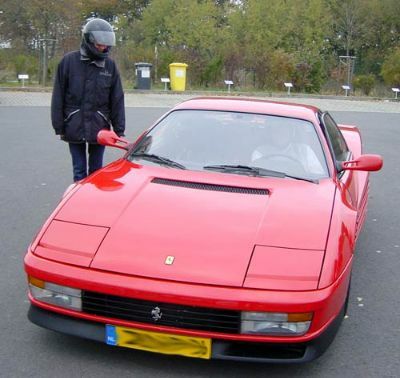 The Ferrari owner was by no means pushing his car, but apparently the car was quite soft, as you would expect for such a big heavy car from the 80's. 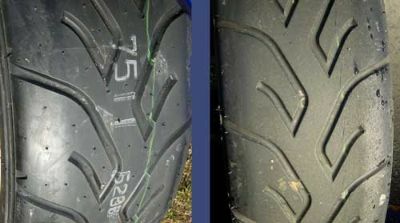 Brakes and tires were not fantastic compared to the latest admitted the driver. 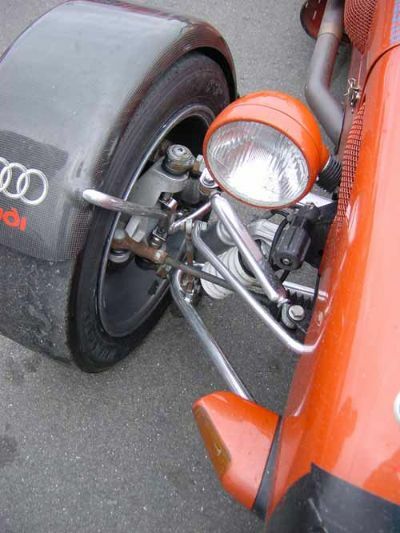 But apparently it was very quick on the straights, and the flat 12 sounded fantastic - as you would expect. After the ride in the Testarossa Tessa managed to get a lap in this GT3 - which was much faster apparently, though the Ferrari sounded amazing at full chat. Lucky girl! 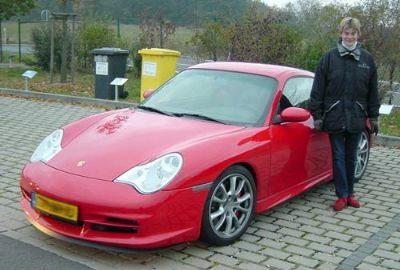 However, the Porsche GT3 was very quick! 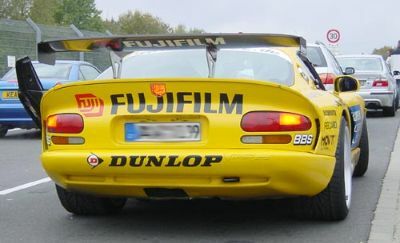 Much shaper and much quicker over the whole lap than the Ferrari, this owner was pushing his car and using its abilities. 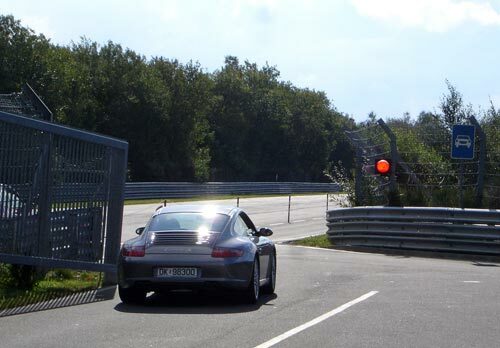 Porsche 911's and all versions of, are very common at the Ring, and look very very capable around the track. 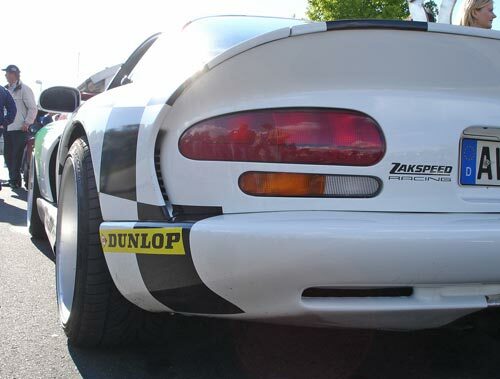 As on most track days in our experience, the 'paddock' is a very friendly place, and a great place to just chill out between laps, have a coffee, and look at the other machines on display. 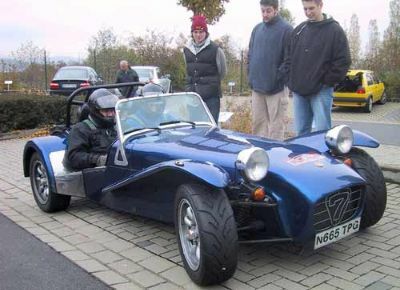 Most petrol-heads are willing to chat about their cars, and don't be afraid to ask for a passenger ride. Of course be careful. If you have no idea what the driver is like then you are taking a chance. You can't see in this photo, but the brake pads of this BMW CSL were smoking as it came to a halt in the paddock. I suspect it was BMW giving rides to journalists. 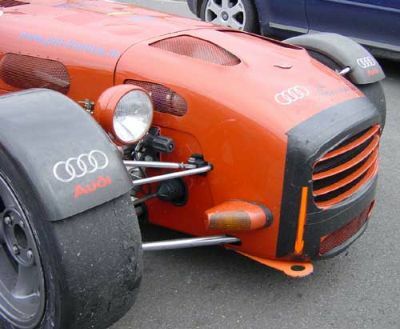 It was obviously very very quick and sounded great as it screamed into the paddock after each lap. 360 Modena Didn't get a ride in this one! 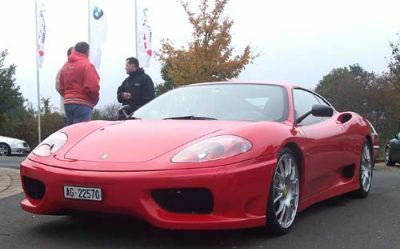 You see all sorts of exotica at the 'Ring. 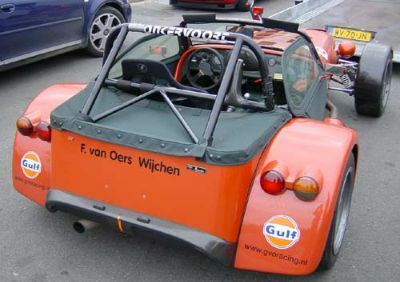 We were in the petrol station next to a Lambourghini Diablo Roadster at one point. And then there was this! 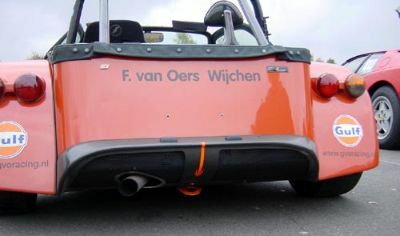 It is a Donkervoort - a Dutch 7'esque car. This one is obviously raced. It arrived on a trailer - which was just as well as he stuffed it at Hohenrain at the end of the day. ...of course you cannot read anything into that - he may have been slowing down - but it was still very satisfying!! This bit needed more than gaffer tape by the end of the day. 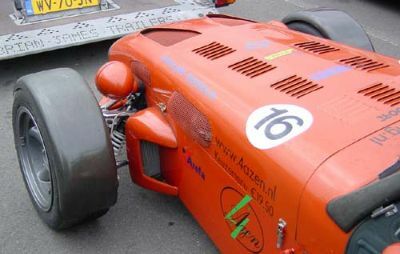 The front left wheel had been pushed right back after overshooting at Hohenrain and hitting the wall of the new circuit. 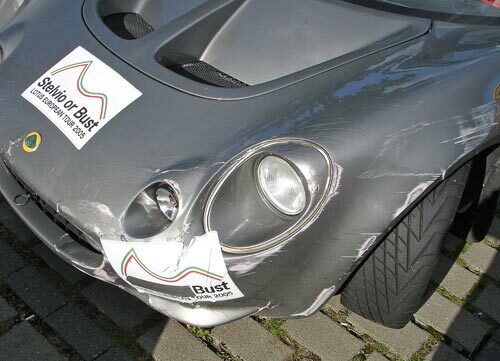 It was a pretty low speed incident, damage actually looked pretty minor and no one was hurt at all. 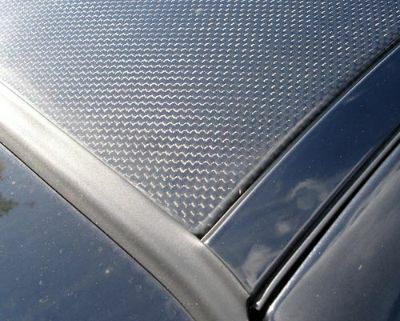 There were some interesting details on this car. I'll be honest - as a modern take on a classic shape, it had some nice touches.